NOTE: Including the module “The First Responder in a Time of Terrorism”. Does your employer store or use hazardous chemicals? May you need to clean up non-emergency hazardous material spills at your site? This course fulfills your OSHA 29 CFR 1910.120 First Responder Awareness (FRA) training requirements and certifies you to clean up non-emergency spills in your workplace. Taking this course will also satisfy your OSHA First Responder Awareness annual refresher training requirement. Upon successful completion, you will receive 0.6 CEUs and an OSHA First Responder Awareness with Spill Cleanup printable pdf certificate. If your job requires you to be involved in emergency response to incidents where hazardous materials or chemicals may be involved? Police Officers, Paramedics, Emergency Medical Technicians (EMTs), and Public Works employees, Security Officers and Emergency Response Team (ERT) Members all benefit from or require OSHA Emergency Response Training. If your work duties may require you to respond to the release of a hazardous material, OSHA requires that you take one of five levels of training. The First Responder Awareness (FRA) course is the most basic OSHA Emergency Response training level. Persons requiring FRA certification work in positions that may require them to respond to a release of a hazardous material, recognize the situation as one requiring specialized assistance, and notify the proper authorities. If your site regularly experiences or has the potential to experience non-emergency hazardous material spills, this course will provide you with the necessary knowledge, tools and training to address these spills in a hands-on manner. A certificate documenting compliance with the OSHA requirement is presented upon completion. For those who are already certified to the FRA level, this course would satisfy the requirement for your annual refresher course. Are you asked to respond to emergency spills? Then you should look at our course #1249. 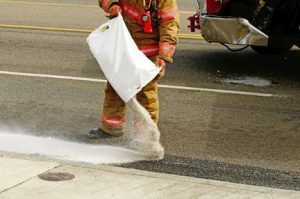 The ability to differentiate between an emergency and non-emergency spill. Understanding of actions to take, special materials to use and techniques for combatting non-emergency spills of hazardous materials. As a first responder you may be called upon by your employer for advice on handling a suspicious package or object. In this course you will learn using the acronym SIN to deal with an emergency situation. Students will have to go through all modules in order to unlock the final exam at the end of the course. You will need a computer or iPad with Internet access and an email account. No text is required; all course materials are available online. The course will take approximately 6 hours to complete.